The Minister of State for Communications (I/C) and Railways, Shri Manoj Sinha delivering the keynote address at the inauguration of the Seminar with States & Union Territories for achieving the vision of National Digital Communication Policy 2018, in New Delhi on December 17, 2018. The Secretary, (Telecom), Ms. Aruna Sundararajan is also seen. 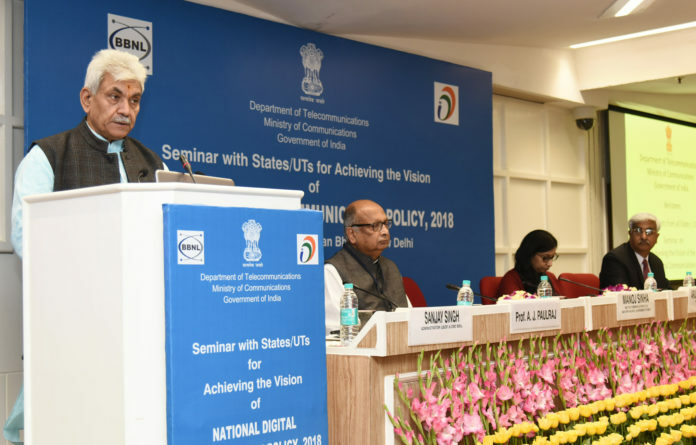 “The National Digital Communications Policy 2018 will catalyse the achievement of the Digital India dream of our Government under Prime Minister Narendra Modi, by nurturing and promoting a robust, competitive, and sustainable digital communications sector”, said Shri Manoj Sinha, Minister of State for Communications (Independent Charge). The Minister spoke to members of the press and media today, while inaugurating a seminar organised by the Department of Telecom, with representation from States and Union Territories. The seminar held in the capital is meant to lay the foundation for collaborative pursuit and realisation of the vision, mission, and objectives of the National Digital Communications Policy (NDCP) 2018. In his inaugural speech, Shri Sinha touched upon the objectives and key features of NDCP 2018.  Objectives such as Broadband for All and the promise of Creating 4 Million Jobs in the sector have the potential to drastically alter the dynamics of the sector, and make it possibly the single-most important enabler of socio-economic development of the country. The Minister cited the ongoing BharatNet project as an example of how determined execution can lead to empowerment of people inhabiting the remote and rural areas of our country. “We have broadband-enabled nearly half the total number of Gram Panchayats in the country, and Phase II of the project is now in progress. In parallel, we are also establishing WiFi Hostpots at each Gram Panchayat to facilitate the utilisation of the infrastructure established by BharatNet.”, said the minister. Speaking on the occasion, Smt Aruna Sundararajan, Secretary (Telecommunications) and Chairman, Digital Communications Commission, highlighted the importance of proactively identifying and addressing implementation challenges, in order to support timely execution of projects. She highlighted the Indian Telegraph Right of Way Rules 2016 as an instrument to facilitate smooth execution of digital communications projects across the country through adherence to a clear, transparent, and consistent set of rules. “We will also take steps to promote healthy competition among States and Union Territories, to further the cause of NDCP 2018.”, Smt Sundararajan said. Shri Sinha congratulated the organisers and participants of the seminar for initiating timely and meaningful deliberations on NDCP 2018, and urged the representatives from the States and Union Territories to leverage the digital communications infrastructure being established by the Union Government, to provide services which will make a substantive difference to the lives of the people of India. “Cooperative federalism is not an empty slogan for us; it is a way of working with stakeholders to maximise the returns from our collective efforts and investments.”, the Minister concluded.